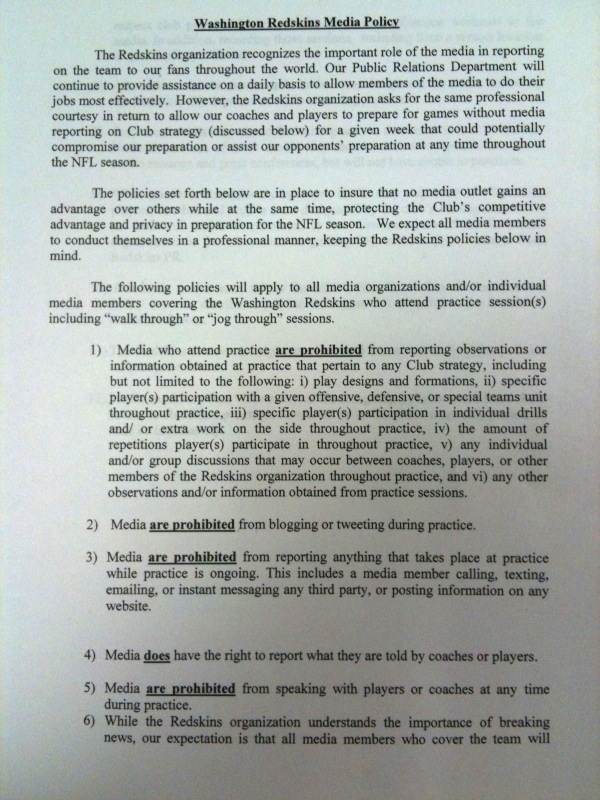 The Om Field: Redskins Media Edict: Things That Make You Go "Hmm." Redskins Media Edict: Things That Make You Go "Hmm." Nature (and the media) abhors a vacuum. Cliches become cliches for a reason...they generally bespeak an underlying truth. Based on nothing more than having lived for a while in and around the periphery of today's 24/7/365 hypermedia scrum surrounding the Washington Redskins and the NFL, I'm thinking a game may be afoot. Nothing—and I mean nothing—having to do with the Redskins goes unreported, unnoticed, un-parsed-to-death. 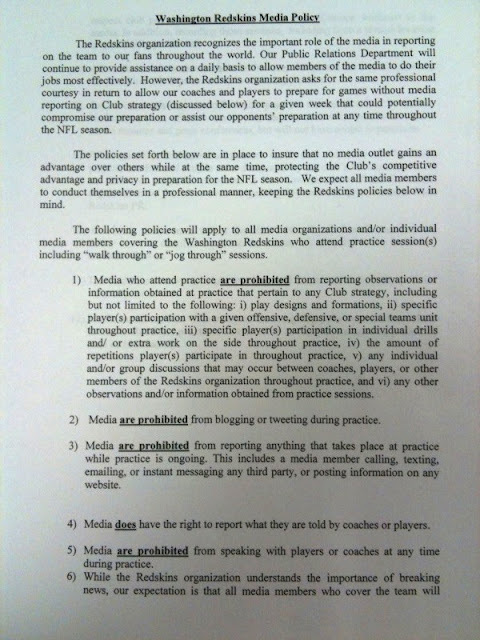 Two days ago local sports radio ESPN 980 announced on the air that the Redskins had issued what I believe they termed a "media edict," handed down by team officials at Redskins Park. ● no more reporting rumors as fact. ● a somewhat pedantic (and truth be told condescending) definition of what a rumor is. I thought it was a joke at first. Really? An edict saying the press could no longer traffic in rumors? Somewhere I was pretty sure W. Mark Felt rolled over. Turns out it wasn't a joke. The station devoted several segments of the show on air at that time to discussing it, and the reaction of local Redskins reporter, columnist and commentator Thom Loverro, who was on at the time—voice rising another octave and unapologetic outrage creeping in— made me think "this is going to be quite the conundrum." Since then? Bascially nada. Zip. Nicths. No leaks of said edict—at least not that I have seen. Think a quick-scanned PDF of that piece of paper wouldn't have gone viral in a nanosecond? Not even a McKenna sighting. I'm no reporter—I'm an independent observer who shares opinion, not a salaried finder of fact. I think what those guys do, for the money they get paid, is a pretty thankless task. I also think some of them get jaded to the point their objectivity gets compromised and it shows in their work. But this isn't about the people doing—or in this case perhaps not doing—the reporting. This is about the fact that this could and probably should have been, given recent history, an absolute media (excuse the language) shitstorm about Dan Snyder and the Washington Redskins yet again trying to Manage the Message, Muzzle the Press and Rule The World. Ghostbusters references in post always make me smile. Too words why this isn't an issue that it could be... Shanahan, Allen. Maybe, brother...but I don't believe even they have the juice to throw a net over the entire local press. Could be I'm misreading my gut feeling on this one and it's just gas, but something tells there's more to this non-story than meets the...um...ear. Either there's a monster in my kitchen or I'm completely crazy. Well, there you go. Just a matter of knowing where to look. Kind of surprised this hasn't spread wider and faster. Again, big fan of the blog and BGO!